Ionic CXV running boards fit seamlessly on this Explorer keeping an OEM appearance. The wide step area is covered in a grippy polymer for a safe step into your vehicle every time. 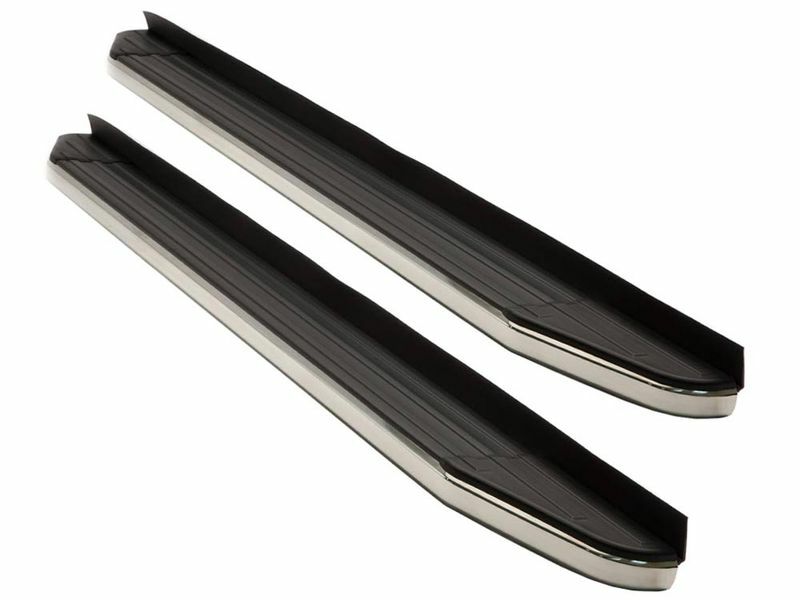 Ionic CXV running boards will give your ride's style a boost and add some extra footing getting in or out. Combining a stylish appearance with rugged durability, these inventive running boards are the ideal way to upgrade your CUV. Constructed from high quality extruded aluminum with stainless steel trim, you can be sure this running board will withstand any adverse weather conditions. They are built tough and are highly corrosion resistant so they can last as long as your ride will. Getting in and out of your vehicle is easy with the large non-skid molded pads that ensure secure footing. The CXV running boards are very easy to install with the brackets fitting right into existing factory holes. By not having to not drill into your vehicle, you'll save time and effort. If you want a running board that combines high quality and comes backed with a limited lifetime warranty, Ionic CXV running boards are exactly what you've looking for. Get yours ordered today!